Property Location In the heart of Orange Beach, Perdido Beach Resort is close to Orange Beach Indian and Sea Museum and Orange Beach Art Center. This beach resort is within the vicinity of Adventure Island and Orange Beach Welcome Center.Rooms Make yourself at home in one of the 346 guestrooms featuring refrigerators and iPod docking stations. Rooms have private furnished balconies. 37-inch flat-screen televisions with digital programming provide entertainment, while complimentary wireless Internet access keeps you connected. Private bathrooms have designer toiletries and hair dryers.Rec, Spa, Premium Amenities Head down to the water and enjoy a day at the private beach, or take advantage of other recreational amenities including outdoor tennis courts and an indoor pool. This resort also features complimentary wireless Internet access, concierge services, and an arcade/game room.Dining Enjoy a meal at one of the resort&apos;s dining establishments, which include 4 restaurants and a coffee shop/café. From your room, you can also access room service (during limited hours). Relax with your favorite drink at a bar/lounge or a poolside bar.Business, Other Amenities Featured amenities include a business center, a computer station, and express check-out. 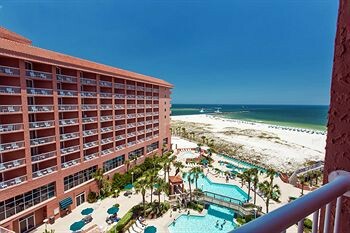 Planning an event in Orange Beach? This resort has 45000 square feet (4050 square meters) of space consisting of a conference center, conference space, and meeting rooms. Free valet parking is available onsite.